Another Undergraduate Research Conference has wrapped up. This event was an opportunity for students from all programs to share and showcase their projects and research. Among attendance, was Julie McNutt, a bachelor of science student majoring in chemistry. McNutt shared her research with The Omega. “Antibiotic resistance has increased over the years due to the over-usage of antibiotics. Consequently, new antibiotics must be designed,” McNutt said. This semester, she’s been working with TRU faculty Heidi Huttunen-Hennelly and Kingsley Donkor. McNutt is researching three compounds that may be able to combat antibiotic resistance. “They have demonstrated the ability to kill bacteria, but I must determine if they will also destroy the cells that make up our blood (red blood cells),” she said. 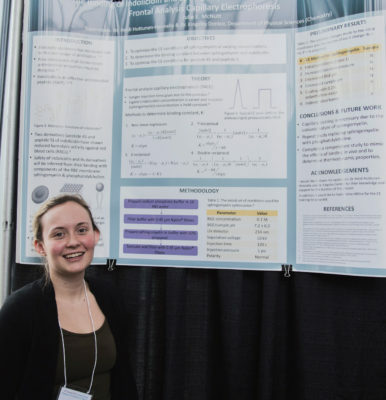 McNutt has received funding through the Undergraduate Research Experience Award Program (UREAP), which will allow her to work over the summer, and following the completion of her degree at TRU, would like to complete a master of science degree in chemistry. McNutt’s work has allowed her to continue to develop her laboratory skills, gain invaluable experience and attempt to solve a problem at the interface of biology and chemistry. This year, the Undergraduate Research Conference was host to more than 200 research posters, 20 artistic exhibits and performances, and more than 50 panel presentations. “We know that the single most important and lasting educational experience involves students working closely with their professors on a shared project,” said Will Garrett-Petts, professor and associate vice-president of research at TRU. “The Undergraduate Research Conference, now in its twelfth year, provides the perfect complement to these programs, encouraging students to share their experiences and the results of their research,” Garrett-Petts wrote via email.